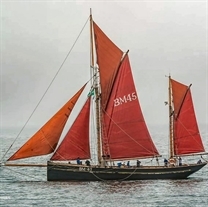 Brixham sailing trawler PILGRIM was built in 1895, by J W & A Uphams, one of Brixham’s most famous yards. PILGRIM was one of six similar vessels built at the yard during that year. Brixham was an extremely busy port at this time, with over 300 similar red sailed, wood built vessels and played a huge part in the development of trawling which places both Port and these famous trawlers at the pinnacle of Britain’s maritime heritage. Provident, a 'Mule' class sailing trawler, was built in 1924, in the same yard on the River Dart as 'Leader'. She was a replacement for an earlier vessel of the same name, sunk during the First World War by a German U-boat. She fished out of Brixham for 10 years before being sold to a wealthy American and converted to a private yacht. After being laid up in Cornwall during the Second World War, she arrived in Salcombe in South Devon, in 1951, as the founding vessel of the Island Cruising Club. In the late 1980’s, Provident underwent a major refit, and was re-launched in 1991. 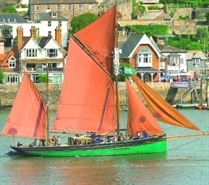 She continued to sail with the Club until 1999, when she started working from Brixham.